(AP) CAIRO - Amid outrage sparked by perceived insults to Islam, one Egyptian newspaper has decided to fight cartoons with cartoons. Al Watan daily says it is responding to the crude caricatures published last week by a satirical Parisian weekly in kind: a series of sketches critiquing relations between the Arab world and the West. The paper says they are a "civilized" alternative to the violent protests across the Muslim world sparked by a low-budget anti-Islam film produced in the United States. 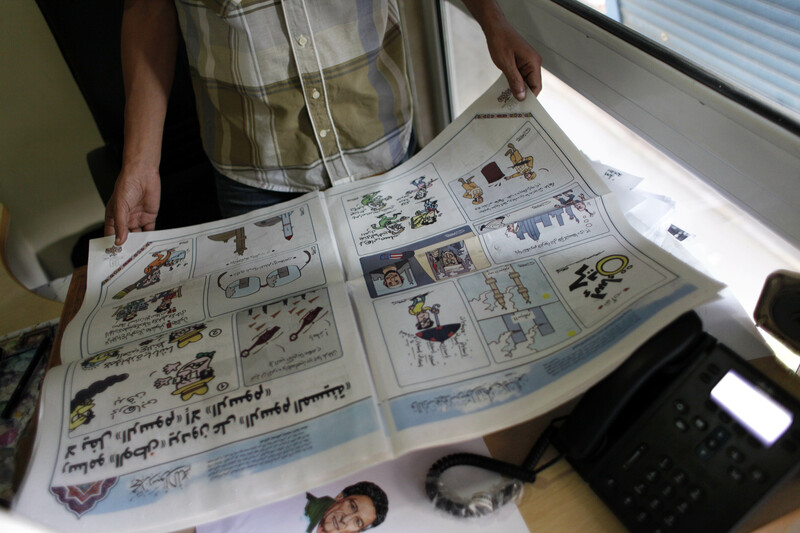 "Nothing cracks cartoons but cartoons," said the banner splashed over the two-page spread published this week. One drawing, captioned "Western glasses for the Islamic world," features a pair of eyeglasses framing the burning World Trade Center towers. Another shows a flashlight wrapped in an American flag pointed at a picture of an angry turbaned man with a knife, ignoring a peaceful Muslim. Both seem intended to suggest that the only image seen by Western audiences of the Muslim world was that of terrorism. The newspaper's decision comes amid a debate over freedom of expression in both Muslim and Western countries over the reaction to the film "Innocence of Muslims." Over 50 people have been killed in violence linked to the video over the past two weeks. In Egypt, protesters breached the U.S. Embassy. Last week, the provocative French magazine Charlie Hebdo published a set of crude cartoons playing off the film and ridiculing the violent reaction to it. President Barack Obama and other Western officials have condemned the film, but said that no speech justifies the violent response. Mohamed El Barguti, an editor at Al Watan, told The Associated Press on Wednesday that the cartoons were a "model of a civilized reaction to all that has happened." The paper published the drawings to show that "burning and killing" is not the proper response to insults to Islam, he said.